Lehman Model 4D-254 90 gallon Aluminum USCG Approved This vessel was a charter vessel in Dana Point Harbor from 2002-2013. 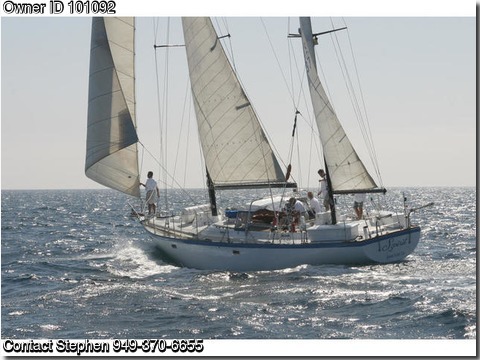 Certified for 25 under sail and 44 under power. USCG License expired however, it is very easy to reactivate. Equipment:	Comnav Autopilot with hydraulic drive 5" Danforth Compass on binnacle 2" Airguide Compass at nav station B&B depth sounder Furuno GP-30 GPS Furuno Radar 16 miles Icom IC-M710 SSB Radio President 711 VHF Radio Horizon Intrepid VHF radio B&G speed and distance logs EPRIB Pressure water system Deep double S/S sink Custom fire alarm USCG Approved Life jackets for 30 Maxwell 2200 Electric windlass 6.5 KW Onan MDKUB generator (2003) 450 hours diesel like new custom powder paint cover 10-12V gel Cell batteries and 2-12V wet cell engine batteries with spark proof main battery selector switches USGC approved heart Interface 1000EX inverter/charger with Link 10 remote control Stereo system with interior and exterior speakers 30 man life raft.